The brands include Butterfinger, Baby Ruth, Crunch and 100 Grand. Nestlé is selling its U.S. candy brands to Ferrero — the company that makes Nutella. 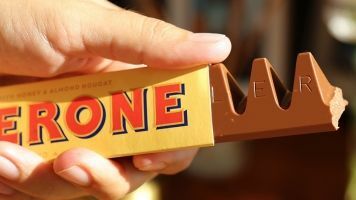 Ferrero is reportedly spending $2.8 billion on the deal, which includes Nestlé's Butterfinger and Baby Ruth brands. That would be a big acquisition for the Italian-based company. If the deal goes through, Ferrero would be the third-biggest chocolate seller in the U.S. Last year, the company also purchased Fannie May Confections and the Ferrara Candy Co.
Nestlé is still a heavy-hitter in the food industry, as well as one of the major players in the invention of milk chocolate. Bloomberg notes, however, the company seems to be stepping away from candy. CEO Mark Schneider said in a statement: "This move allows Nestlé to invest and innovate across a range of categories where we see strong future growth ... such as pet care, bottled water, coffee, frozen meals and infant nutrition." This pivot away from the chocolate industry is getting more common among food giants like Nestlé, and that's because the industry in the U.S. is in a slump right now. Last year, Hershey announced plans to cut 15 percent of its global workforce. On Tuesday, Lindt & Sprüngli reported its weakest organic sales growth since 2009.